Babies are a blessing. They bring joy into your life and complete you. However, babies do come with a little extra work. It’s amazing how many stains such a little person can create. We can’t really help you with every aspect of being a new parent, but we can help with the laundry side of things. Baby skin is soft and sensitive, thus requires extra attention when it comes to what touches the skin. Baby clothes and toys should be the cleanest and softest things in your house. This is to avoid irritation, allergies, and overall discomfort to your baby. The baby room is finally ready, cute tiny clothes are in the little drawers, and the crib is built and ready to go. You’re all set right? Bring on the baby! 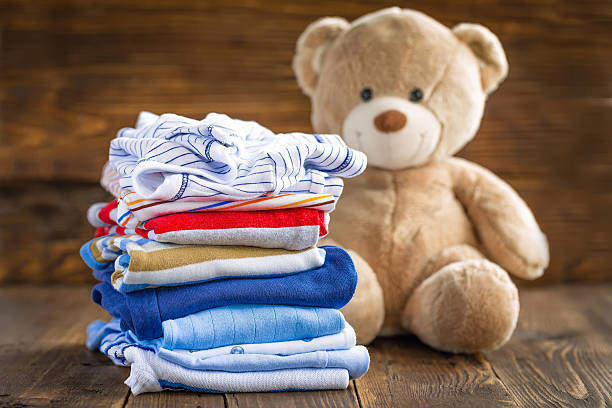 Not so fast.. Did you know how many things your baby’s clothes and blankets were exposed to on the way from the factory to the shop where you bought them? Brand new clothes may have been chemically treated, contain factory and warehouse dirt and dust, and germs from the people who handled the clothing as well as the germs of people who touched the clothing in the store. Pre-washing your baby’s clothes is important to remove all the unknown stuff that may be living in them. This also counts for all bed sheets, baby blankets and other fabrics your baby will come into contact with. Wash the clothes at the highest possible temperature, according the to tag. Iron them (if the label allows) at the highest temperature as well, to kill remaining bacteria. Wash your washing machine! A lot of dirty clothes have been in your washing machine before your baby’s clothes. Make sure to clean your washing machine before washing your baby’s clothes. Run an empty wash cycle on the highest temperature with a cup of white vinegar to kill all bacteria that might be living inside of it. Do this every couple of weeks to keep your washing machine fresh and hygienic. There are many specially formulated detergents available to cater to the skin of your baby and young children. Most baby care detergents are available at your local supermarket. Some families simply opt for regular detergent without the harsh chemicals or fragrances, such as Neutral or other pH neutral and dermatologically tested detergents. Do avoid using softeners in your baby’s wash, because the dyes and perfumes may irritate your baby’s skin. Instead, add 1/2 cup of vinegar to the load to naturally soften clothes. Stains should be treated as soon as possible. The sooner you treat the stain the easier it will be to remove. Scoop up or wipe away as much of the stain as possible before you start the treatment. Soak the garment(s) in cool water for about 20 minutes. This may be enough to remove simple stains such as drool or formula. If the stain is stubborn such as excrement or urine, then pre-soaking will loosen up the stain before going in with cleaning agents. You can also add vinegar to the water to remove odors and brighten the clothes. For stubborn stains, mix a few spoons of baking soda with water until it forms a paste. Coat the stains with the mixture and let sit for about 20 minutes. Launder the clothes as usual, following tag instructions. Soft toys, such as stuffed animals are every child’s (first) best friend. However, stuffed toys take a lot of abuse and can easily collect dirt, germs and bacteria. 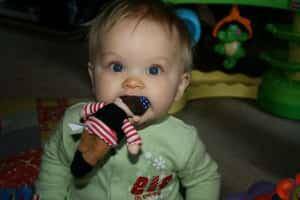 It’s just as important to keep toys clean as it is to keep baby blankets and clothes clean. The fur and fuzz is an ideal breeding place for mold, dust mites, and pet hair. You can see how this may affect the health of a child if not washed periodically. *You can keep a soft toy in the freezer overnight to start killing mites before you proceed to the next steps. Place the toy in side a pillow case or wash protector. Add (baby appropriate) anti-bacterial detergent and wash on the gentle cycle. To remove odor, sprinkle the soft toy with some baking soda before placing it in the washer. Add some vinegar to the rinse cycle to keep the toy soft and fluffy. Baby laundry note: wash toys separately from clothes and check toy labels for any specific washing instructions.